This treadmill is sure to become the most sought after piece of fitness equipment in fitness clubs, purely because it satisfies this desire while offering much more. A wide choice of different exercise modes is easily selected from several courses stored in its programming memory. 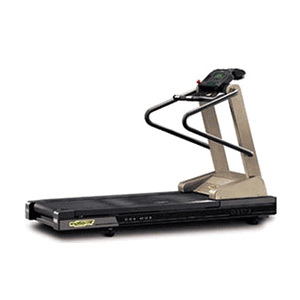 The treadmills consol features easy to use push buttons for selecting the speed and desired gradient. A running shock-absorbing platform protects the knee and ankle joints and in addition it also features the exclusive CPR System to ensure that the training level is continually adapted to the pre-set heart rate (not available on this model) values. A powerful and reliable AC motor ensures trouble free durability and smooth operation under the most severe usage.